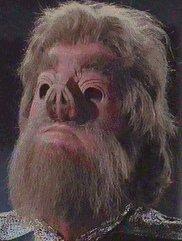 Tellarites are short, stout, porcine humanoids with hooved feet, thick hair on their head and brows, and short upturned noses, They have acute hearing and smell, but as they get older Tellarites become increasingly near-sighted, They were among the first members of the United Federation of Planets. Miracht, or Tellar as it is known within the UFP, is the Tellarite homeworld. It is an uncommonly stable world with almost no seasonal changes. the surface maintains a near constant temperature range between 62 degrees F at night and 83 degrees F during the day. When the Tellarites were first contacted by the Federation, it was the first contact they had had with an alien species, The resulting chaos that ensued was one of the early arguments for establishing the Federation's Prime Directive, Since their enrollment in the UFP the Tellarite people have shown an uncommon aptitude for engineering, and have made notable contributions in the fields of propulsion and structural design. -Acute Balance: Tellarites have an unusuually acute sense of balance that gives them a +2D to running and acrobatic skills. -Hearing and Smell: Tellarites have highhly developed auditory and olfactory senses, giving them a +2 bonus to PER rolls based on these senses. -Near-Sighted: Tellarites lose most of ttheir eyesight as they age. They receive a -2 on PER rolls based solely on sight. -Skill Bonus: At the time of creation onnly, Tellarites receive 2D for every 1D spent in any repair or programming skills. The Tellarites are an cousin race to the Ugnauts and actually hail from the same homeworld. The Tellarites have little interest in galactic affairs like their cousins, but when the chance to make some credits comes their way they are not above engaging in some larceny to do just that.